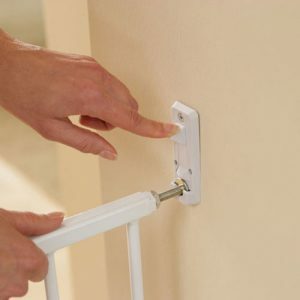 Unlike pressure mounted baby gates, which have spindles that push into the wall to stay up, hardware mounted baby gates have brackets that you screw into the wall, then connect to your gate. For this reason, they are also often called wall mounted baby gates. 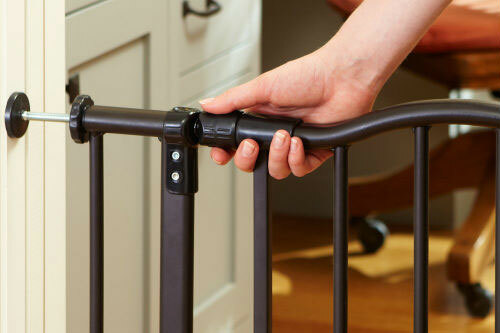 A hardware or wall mounted baby gate requires screwing the included hardware into your wall. 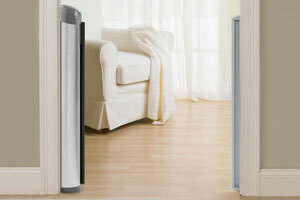 Learn more about the difference between hardware mounted and pressure mounted baby gates. 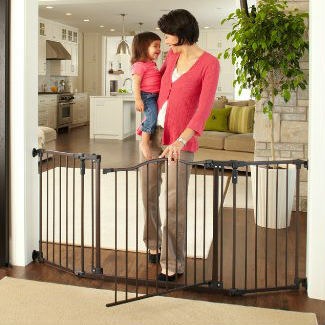 There are a number of different types of wall mounted baby gates that can serve different purposes in your home. Below we’ve made a comparison table of some of the best, highlighting their key attributes. Take a look at that, then you can view below the table for a more in depth look at a few of the standout hardware mounted gates. We hope the comparison table above has been useful for getting a quick look at key attributes of some of the highest-rated hardware mounted gates. Below we have examined a few of those models in more detail to further help you pick the perfect gate for your home. 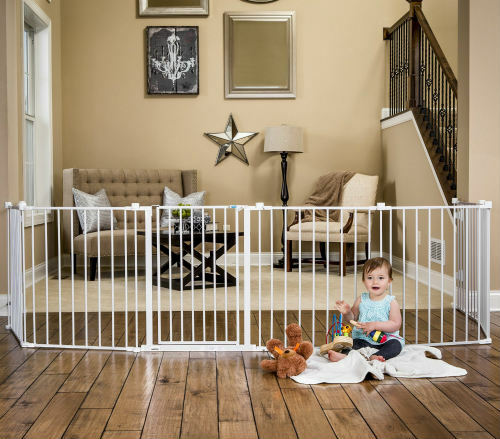 The North States Supergate Deluxe makes an appearance on several of our lists, as it is certainly one of the most stylish baby gates available. 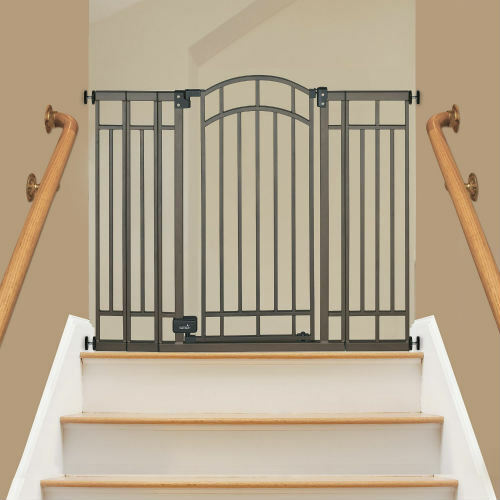 It is the larger deluxe version of the simpler North States Supergate also found in our comparison table above, is hardware mounted only, and is best suited for openings wider than your typical doorframe. It is one cohesive piece (the wings do not separate), but because the wings pivot this gate can be made to span any space between 38 and 72 inches wide. If your space is at all less than 70 inches, this pivoting actually creates a really nice curved effect with the gate, with the straight door section protruding out from the diagonal wings. The result is a classier arch shape, which is accented further with the elegant matte bronze finish. The gate is also available in white if that matches your home’s decor better. The gate is conveniently removable from the mounting hardware, which lets you store it out of the way for periods of time when you don’t need it up. 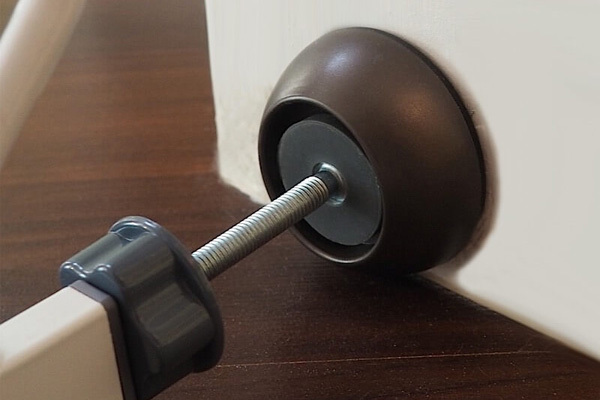 Reattachment is simple with a quick snap into the wall hardware. What’s more, if you like this gate but need it to span a width wider than 72″, there are 15″ extensions you can purchase separately in both colors, although they can be harder to find in stock. The Regalo Super Wide Gate is in a class all of its own in terms of width. It has a maximum width of 192 inches (16 feet, or 487 centimeters), so can span pretty much any home space, even an open concept living room. As such a wide gate, it is naturally hardware mounted at the ends. 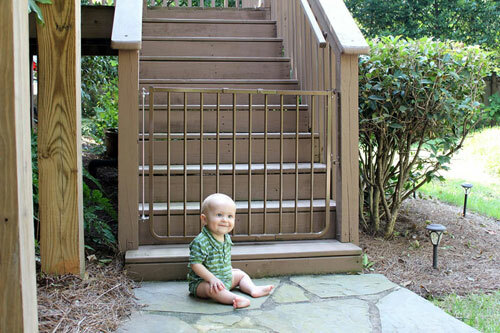 However, because of its 8 folding, detachable 24-inch wide sturdy steel panels, this gate also can also stand on its own using a zig-zag pattern and even has the ability to fold around on it self to form a play yard. Each panel pivots to keep the whole gate flexible over a wide span. It is not necessary to use all the panels, letting you enclose a space as small or large as you like. This makes it well-suited for extra wide stairway entrances that flare out, hard fireplaces that you want to make sure are off limits to babies, or large open rooms where you can span the width or create a circular 19-square-foot playpen for the little one to safely play in. 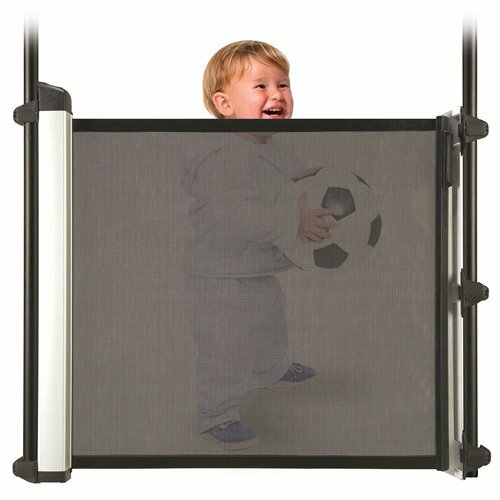 What’s more, if you wanted an even larger play pen or baby gate, all you would need to do is buy another set as there is no limit to how many additional panels you can connect. As an alternative, North States, the manufacturer who appears most often on our list, also makes a super wide gate that’s a matte bronze color. It can look higher end with a bronze finish, but it’s a little smaller at 144″ and costs nearly twice as much. It is a great stylish pick though if you’re looking for an extra wide hardware mounted gate and are less budget conscious. 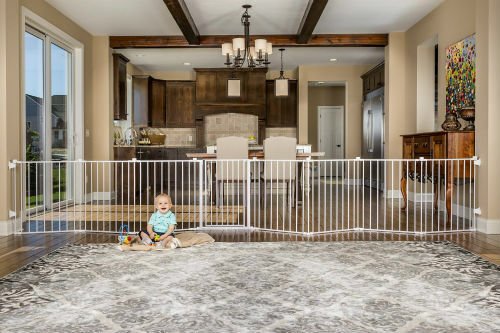 The Retract-A-Gate Safety Gate is among the most expensive baby gates, but it is also the highest-rated retractable baby gate. Retractable gates are hardware mounted to your wall, pull open to span the width of your opening, then easily retract back into their minimalist housing to be out of the way when not needed. 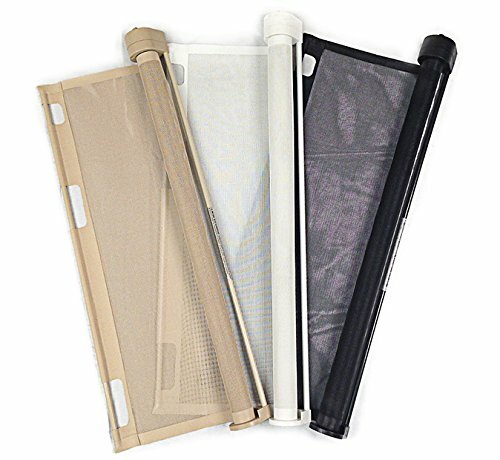 The Retract-A-Gate comes in two sizes: a standard 52″ wide version and an extra-wide 72″ version that costs about $30 more. 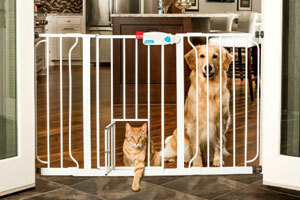 Its high-quality material makes it one of the most popular retractable gate models. 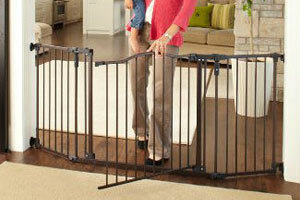 Many retractable baby gates are made from mesh, which can sometimes be quite weak. 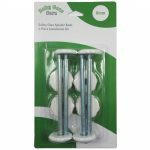 But the Retract-A-Gate model uses a high quality, scratch-resistant mesh that is designed to be extra sturdy. Importantly, the Retract-A-Gate is JPMA certified for use at the top and bottom of stairs. 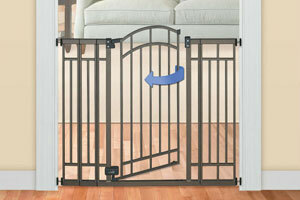 Even though the Retract-A-Gate is pricey, it is a quality gate that has been highly rated by parents. 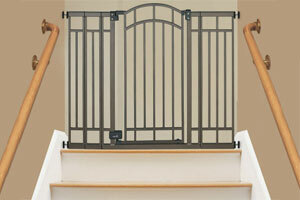 If the type of hardware mounted gate you are looking for is the retractable style, it is the best option. 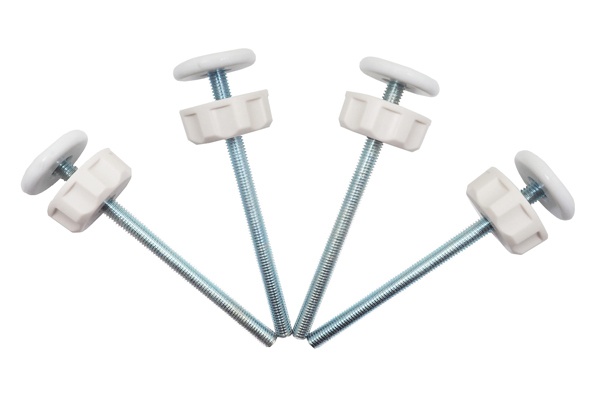 Baby Gate Replacement Screws: What Size Spindle Rods Do You Need?